Senate Bill to Designate the Route 66 National Historic Trail 2019 Cost-Share Grant Season is Now Open! On February 6, 2019 the U.S. House of Representatives passed H.R. 66, known as the Route 66 Centennial Commission Act. Introduced by Representative Rodney Davis (R-IL), the bill is co-sponsored by Representatives from California, Arizona, New Mexico, Oklahoma, Missouri, Illinois, and New Jersey. 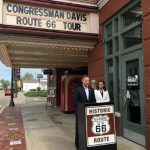 The bill, which was first introduced to the House Transportation and Infrastructure Committee on January 3, 2019, proposes to establish a Route 66 Centennial Commission and directs the Secretary of Transportation to prepare a plan on the preservation needs of Route 66. On February 7, 2019 the bill was referred to the Senate Environment and Public Works Committee. Click here to learn more about the bill and here to see House remarks.